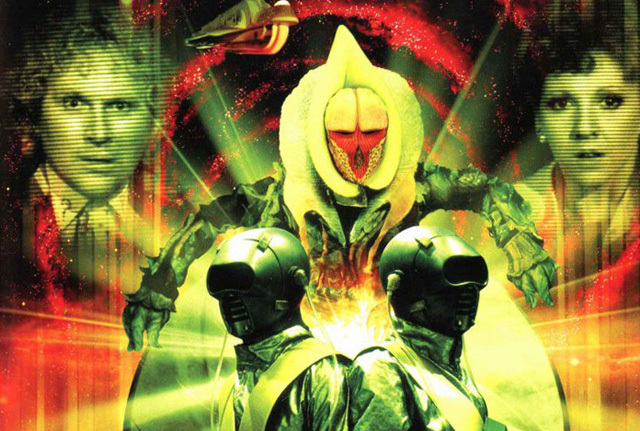 1986: Doctor Who - Looking Back At TERROR OF THE VERVOIDS | Warped Factor - Words in the Key of Geek. Tony doesn’t have green thumbs. The Trial of a Time Lord season was a result of events following the end of Season 22. Stories that had been commissioned, or that were in discussion, were ditched, scuppering the likes of a return for the Celestial Toymaker in The Nightmare Fair, and a story that would have brought back the Ice Warriors, alongside their business partner, Sil, Mission To Magnus. Of more dubious likelihood was a Robert Holmes story that would see the Autons make another attempt on the Earth. After the eighteen month hiatus, rather than simply carrying on with business as had become usual, the Production Team developed the trial structure as a way of framing four stories to assure both consistent fans, casual viewers and deeply unfriendly executives within the BBC that Doctor Who was able to deliver business as had been usual in its glory days – 25-minute episodes, classic stories and the best and brightest of new and established writers. Robert Holmes gave the season its kick-off, despite by that point being critically ill, and as a result, The Mysterious Planet is a compilation of some of Holmes’ greatest and most successful story tropes, rather let down by the imposition of the trial structure. Philip Martin, the shining star of Season 22, was invited back and, rather than simply reusing his Magnus script, crafted Mindwarp to advance the trial aspect of the season, while scaring the bejesus out of viewers and killing off Peri in the most breathtaking way. When it came time for the Doctor to begin his own defence, Pip and Jane Baker, another pair of writers new to Who, who had been responsible for the invention of the first new villainous Time Lord in the Doctor’s universe in over a decade, the wonderful Rani, were invited to create an Agatha Christie-style murder mystery, with monsters. 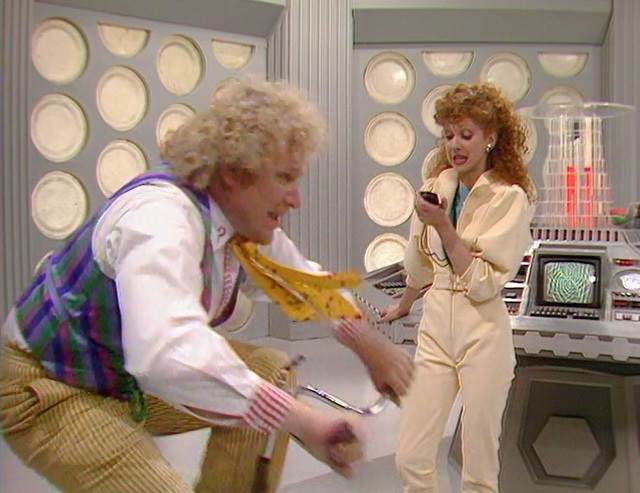 As part of the package, they also got to introduce the Doctor’s new companion, Melanie Bush, played by popular entertainer and actress, Bonnie Langford. They were hampered in that second element by two things. Firstly, the story had to be set in the Doctor’s future, so there was no chance for a proper origin story for Mel. Secondly, they were given a legendarily slim character biography – Mel was a computer programmer who liked to keep fit, and had a photographic memory. That was all they knew about her when they began to write Terror of the Vervoids. It was as much as we knew about her when they’d finished filming it too. 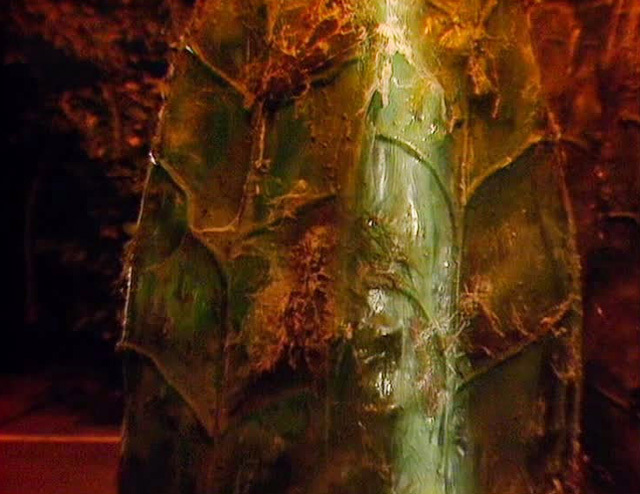 Atmospherically, Terror of the Vervoids initially benefits from the framing device of the trial, as it allows the Doctor to set the scene before we go into it. We’re primed from the start, knowing that somebody on board the Hyperion III will become a murderer. We’re also primed by knowing there will be things on board called Vervoids, and that they’ll be…erm…terrible. It’s possible that no-one suspected quite how terrible though. The sets of the Hyperion III are well built, giving some height to the story and making us buy into the ship as a cruiser, a kind of floating luxury hotel for interstellar travel. The Bakers do their job extremely well in the first episode, layering characterisation into many of the passengers and crew, and delivering hints that there are shenanigans afoot long before the murders begin. Agronomist Professor Lasky, played by the wonderful Honor Blackman, is a sharp-toothed mature academic, and she and her team, the loyal Bruchner and the jittery Doland, have an area of the hold sealed off, transporting some unique plants. There are aliens on board too, the Mogarians, who have a grudge against humanity and its mining policies. The security officer, Mr Rudge, is an old man who’s only got so far, and has a chip on his shoulder. Edwardes, the communications officer is a smoothie slimeball and a world-class patroniser of women. Janet, the stewardess is too nice by half. Commodore Travers, in charge of the ship, is an older man, oozing competence and dismissive charm, and he’s run into the Doctor before. And an old man named Kimber thinks he recognises a fellow passenger named Hallett – but Hallett disowns both the name and the connection immediately. The stage of the Hyperion III is set. All that remains is to start the killing. When Hallett appears to have been thrown into the waste disposal unit after investigating the agronomists’ area of the hold, it looks like the murders have already begun. And from there, it’s a short hop to the death of Edwardes by electrocution in that same area. As he dies though, the ‘hand’ of a Vervoid emerges from a pod to give us a spin for the end of episode 1. To give the Bakers credit where credit is undoubtedly due, their layering of issues, personalities and tensions is excellent, making Terror of the Vervoids a compelling watch on a purely human level, and as the bodies begin to mount up – after Edwardes meets his high voltage death, a Mogarian who isn’t a Mogarian is poisoned in full view of everyone, giving the drama a true Christie twist – it begins to look like Terror of the Vervoids will play out like And Then There Were None in space, which would be no bad thing in itself when it’s delivered with this level of skill. But that reckons without the Vervoids themselves, who replace strategic, rational killing with a kind of ideological warfare against all ‘animalkind’ – they intend to build a compost heap of all the animal flesh on board (we’re left to wonder whether that will indeed be its purpose, whether the Bakers intended to borrow from John Wyndham’s classic killer plant story The Day of the Triffids and have the Vervoids nourish themselves by absorbing nutrients from rotting corpses) and to travel to Earth to establish their dominance. In itself, there’s something exciting about this escalation from semi-rational cold-blooded murder to ideological warfare – if you want to, you can view it as a treatise on moderacy unwittingly aiding the expansion of fundamentalism in viewpoints, and being ultimately subsumed and destroyed by it (the original murderer, thinking they are a friend and a helper to the Vervoids, is taken entirely by surprise when they themselves are killed). It would be a disservice to the story to claim that no-one’s ever looked more like a man in a silly costume than the Vervoid actors – Peter Davison had his fair share of ‘Seriously, what the hell is that supposed to be?’ moments (*cough, cough, Warriors of the Deep, cough*) and so did every other Doctor going back to William Hartnell. 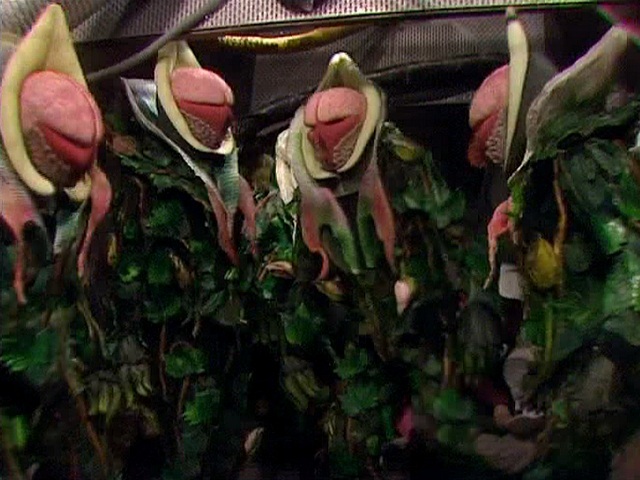 But the Vervoids are certainly up there in the ‘Stupid Costume’ stakes. It’s a crying shame, because they actively let down the suspense that the Bakers, director Chris Clough and an excellent cast work extremely hard to build. And as for Mel, it should tell you everything you need to know that they pitched her scream especially to fit in with the sting of the end credits. The Bakers tried to make her a more active-minded instigator of the investigations, and Bonnie Langford tries hard to make Mel more than the script gives her, but she’s still woefully underserved and ends up seeming like another in a long line of screaming girls, leaving audiences longing for Peri ‘I can shout just as loud as you can’ Brown. Terror of the Vervoids is better than the sum of its weaknesses though, and watched thirty years on, it feels like a great story with a deeply unbelievable monster and an underdeveloped companion. At the time though, with Doctor Who returning to an audience, particularly at the BBC, that was looking for flaws and reasons to disown it, it gave that audience two things to latch onto, at the expense of the excellent work that went in to the human side of the story.